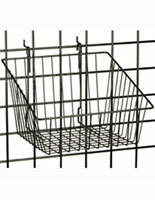 These Gridwall Baskets Are for Small to Medium Sized Merchandise. 12-inch Deep Baskets are 4 inches tall to Keep Objects Secure! 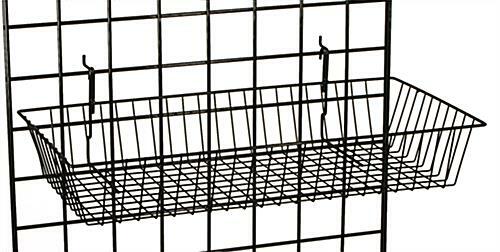 Order Gridwall Baskets and Other Wire Panel Accessories for Retail Store Fixtures Online! Roomy 24" x 4" x 12" construction is made from durable steel. Creates highly visible bulk display of impulse items. Hooks on the back attach easily to grid wall panels. 18.0" x 4.0" x 11.5"